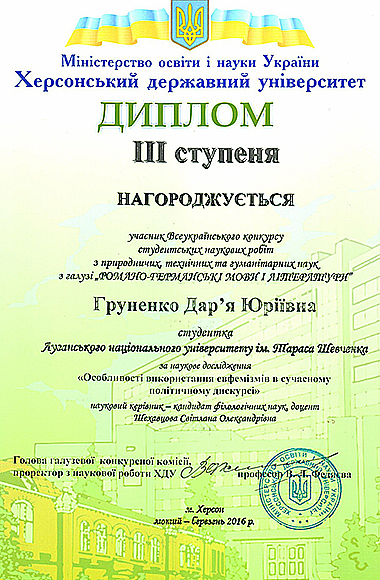 The student of Romanic and Germanic Philology Chair has achieved a prize place in research papers contest in English. Ukrainian Contest of Student Research Papers has taken place at the premises of Kherson State University. About one hundred student research papers have been submitted to the contest committee. Students from different cities of Ukraine have prepared their research papers: Vinnytsia, Dnipropetrovsk, Drohobych, Zhytomyr,Zaporizhzhia, Ivano-Frankivsk, Kyiv, Kremenchuk, Kirovohrad, KryvyiRih, Lviv, Mariupol, Melitopol, Mykolaiv, Odesa, Poltava,Pereiaslav-Khmelnytskyi, Rivne, Starobilsk, Sumy, Uzhhorod, Uman, Kharkiv, Kherson, Cherkasy, Chernivtsi and Chernihiv. Independent reviewers were refereeing research papers during January – February. Then at the end of February the jury chose student research papers to be presented at the final stage. 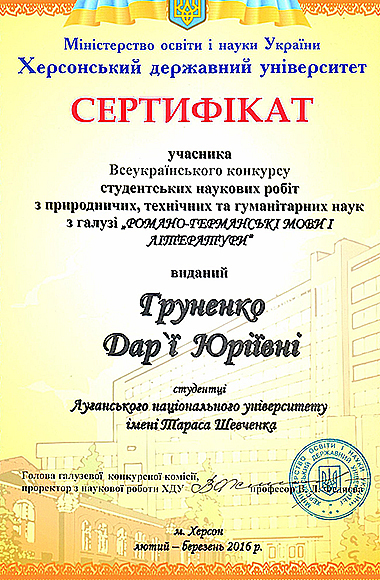 Our university was represented by the fourth-year student of “Spanish and English Language and Literature” from the Faculty of foreign languages. Grunenko Daria. Her scientific supervisor is the Head of Romanіc and Germanic Philology Chair Svetlana Alexandrovna Shekhavtsova. Daria presented the research work on thetopic: “Peculiarities of use of euphemisms in modern political discourse” and took the third place in the second stage. She was awarded with diploma and certificate of participation. 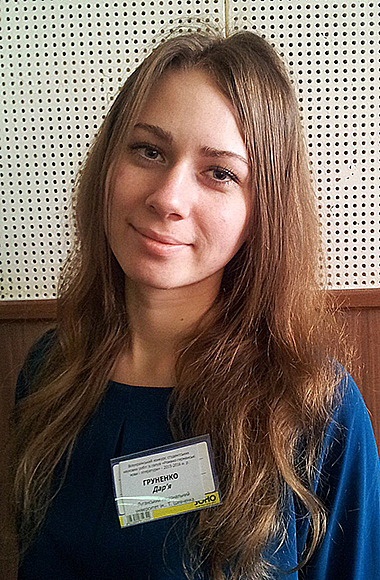 Faculty of foreign languages congratulatesheartily Dasha with the success and wishes new scientific achievements!